The Kings County Asylum, aka, Kings Park Psychiatric Center operated (in Kings Park) for over 100 years from 1885 until 1996. A sprawling landscape and at its fullest, the site housed over 10,200 patients with a wide spectrum of patient therapy conducted that varied from “rest and relaxation” farming, to prefrontal lobotomies and electroshock therapy. A cemetery can be found near the water tower filled with former patients, which some of the bodies were unclaimed with unmarked tombstones, while others paid in advanced with their names displayed. 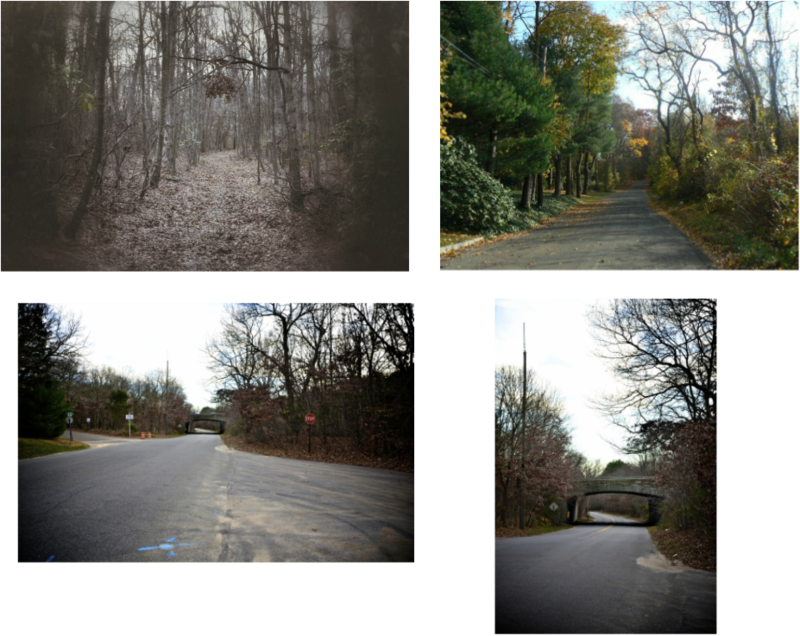 After Kings Park closed, the patients were either discharged or transferred to Pilgrim Psychiatric Center. Paranormal claims include unexplainable noises, (white) apparitions, and disembodied screaming/moaning voices. 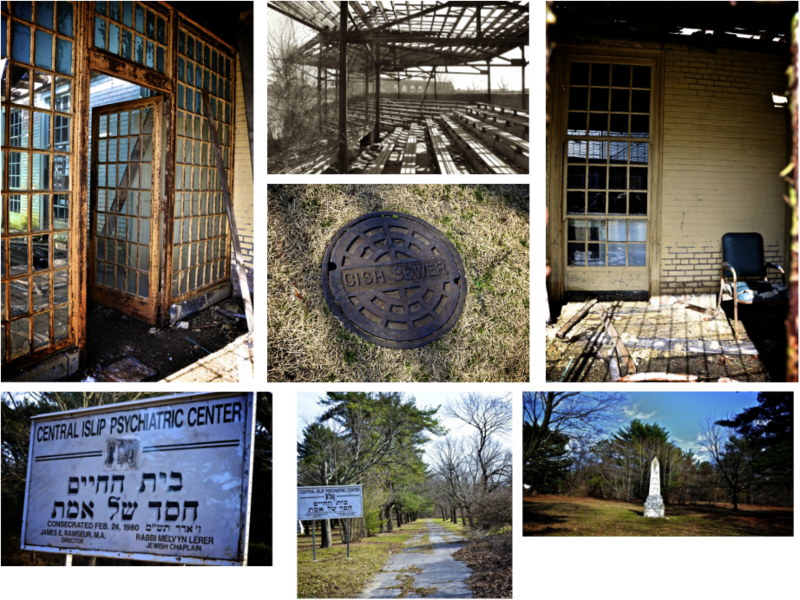 Pilgrim Psychiatric Center ("Pilgrim State Hospital") is a state-run hospital located in Brentwood. 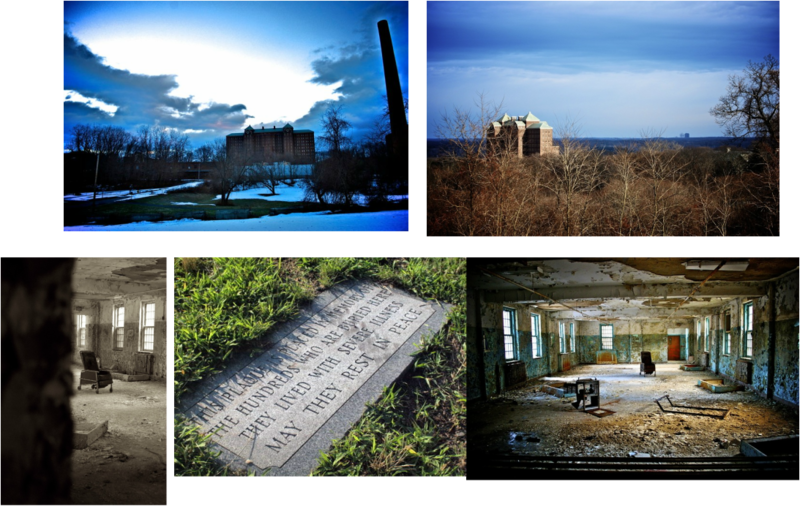 On October 1, 1931, Pilgrim State hospital opened it's doors as the largest Psychiatric Center in the world. It housed a mini city onsite that included police and fire departments, post office, railroad (LIRR) station stop, water tower, court, potter’s field, power plant, wine farm, church, cemetery, and large doctor/nurse housing section. 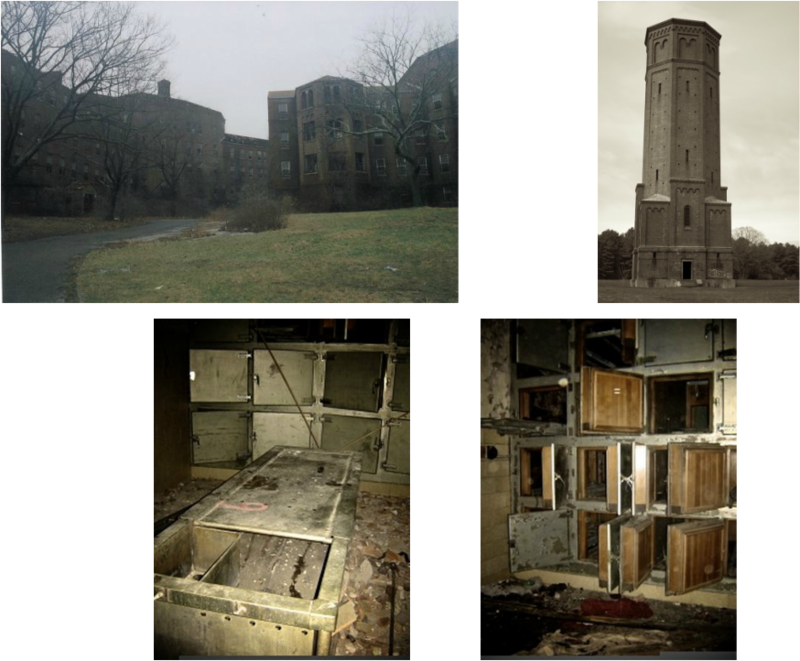 After WWII, Pilgrim State Hospital had an astonishing 13,875 patients and over 4,000 employees. With the advent of new anti-psychotic medications and a rise in available community services, the rate of patient discharges increased. Today, the hospital is still active, but with far less patients than the earlier days. For just over 100 years, the Central Islip Psychiatric Center stood and held over 10K patients at its prime, which made it the second largest in America. Like its Long Island counterparts, it held a mini city, but today only a shell stands compared to its preceding days. The main building is supposedly haunted with claims that include disembodied voices and mysterious noises. The nearby Potters Field contains the remains of over 5,000 patients. Katie’s Bar sits on the site of the old Trainor Hotel, which burned to the ground in 1909. The hotel's part owner and bartender, Carl “Charlie” Klein, aided the FBI with information on mobsters who posed as G-men, which led to the arrest of many. Just before the end of prohibition, Charlie was arrested for the attempted sale of alcohol to an IRS agent. He found the thoughts of jail and leaving his wife unbearable, and instead committed suicide in 1933. Among other purported paranormal activity, a entity nicknamed "Charlie" haunts today's patrons and employees. Katie’s Bar has been featured on Paranormal State's “Beer, Wine, and Spirits,” and Bio Channel's “My Ghost Story.” (Full Haunted History) The owner, Brian Karppinen, has numerous videos of wine glasses flying off the racks, and the soda tap lifting up out of the holster. Listen to past live "Misguided Souls with S.O.P." show at Katies Bar. 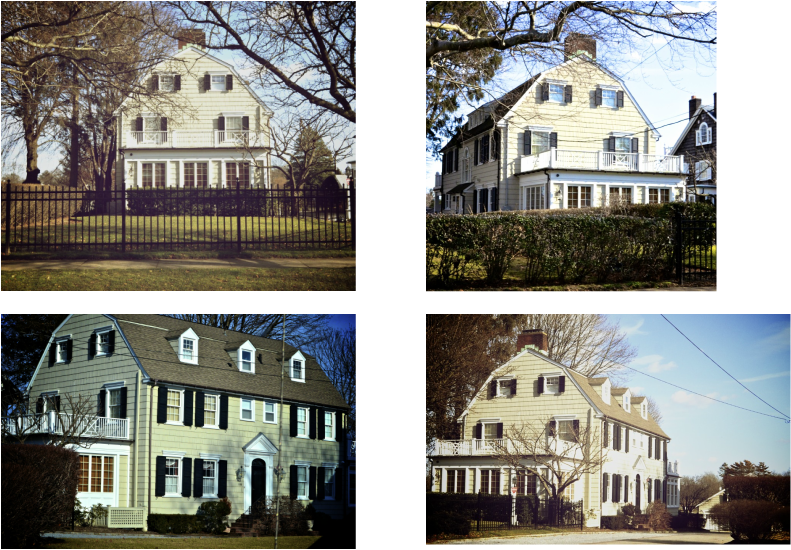 One of the most infamous places in the world, the Amityville Horror House first made headlines on the murderous night of November 1974 when known drug abuser Ronald DeFeo Junior's killed his family. Just over a year later around the same time as DeFeo's conviction, a new family, The Lutzes bought and moved into his old home where the murders occurred. Within a few months, the house was put up for sale by George Lutz and then inspected by a group of psychics and demonologists. Both parties claimed of different paranormal occurrences that included cold spots, disembodied voices and mysterious noises, as well as, unexplainable feelings of being touched, sadness/and anger, and unknown presences. To this day, controversy surrounds the known facts of the murder, and if it's actually Haunted or Hoax? Built on top of the Suffolk County Tuberculosis Sanatorium that originated in 1916, the Ammerman Campus in Selden currently stands at the same location since 1961. Two of the sanatorium buildings remain:"The Ross (Ammerman) Building" named after Dr. William Hugh Ross who was a founding doctor from the sanatorium, which was used to house the male tuberculosis patients, and Kreiling Hall or "The Marshall Building," with a sign on the top above the columns that still bears it's namesake. Named after Dr. J.H. Marshall who was the former president of the sanatorium's Board of Managers, the Marshall Building once housed sick children who had tuberculosis. Although paranormal rumors are officially denied by school officials, the basement there supposedly was used as a morgue during the days of the sanitarium and is purported to be haunted. Quaintly located on the Swan River in Patchogue, Hanging Tree has lured paranormal investigators for years with tales of hauntings. Historical claims exist that during the 1600’s, suspected witches were hung from this tree. Recent stories are told of multiple people who were found dead hanging from this tree, either by suicide or murder, however, no evidence currently exists to backup any of these historical or current claims. Letters visibly carved in the tree display a memorial to a local person who peacefully died at a young age (not at the tree), and was a lover of the location. 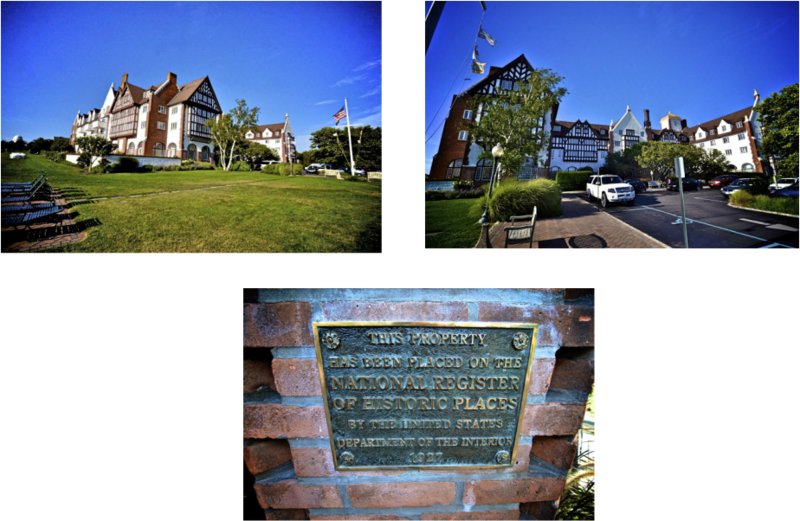 Located in Glen Cove on Long Island's North Shore, beautiful Winfield Hall was built in 1917 by F.W. Woolworth as a replacement for his original Winfield house that burned down in 1895. In the same year as the completion of Winfield Hall, Woolworth's daughter Edna committed suicide in NYC, and two years later, Woolworth died from a severe tooth infection. After his death, the property was purchased by Richard Reynold's wife of Reynolds Metal Company, then was sold again and used as a business school for young girls called Grace Downs Academy in the 1960's. Paranormal claims include a woman crying in the Marie Antoinette Room, a female apparition seen on the grounds, and the current owner believes that the ghost of F.W. Woolworth still haunts the property according to a 2012 NY Times Article. Known as a war cemetery with a multitude of veteran graves spanning from the 19th century to WW1, and post WWII, Five Corners Cemetery was first established in 1862. Located at the corners of Hawkins Avenue & Smith Street, the site is currently known as site's name as Lake Ronkonkoma Cemetery and additional plots continue to be sold. Suffolk County Potter's Field is part of what was once the Suffolk County Almshouse on Yaphank Avenue in Yaphank. The Almshouse housed some of the homeless in Suffolk County until the John J. Foley Skilled Nursing Facility was opened in 1994. The Almshouse became Suffolk County Offices. Across the street from the Almshouse was the Children's Home, where orphans aged two to sixteen lived. The Potter’s field was a cemetery for individuals who died at the Almshouse and the Children’s Home. The numbering systems used for the stones at Potter’s Field were set up by the first Superintendent of the Almshouse. Theses numbered stones were used to record and register deaths. The urban legend of "Mary's Grave" has existed for a long time with many variations and locations. Even one location can have slight differences in retelling. In this particular local legend, a woman named Mary killed herself from love lost due to war or jealousy of a lover. Paranormal tales include a female apparition hanging from the tree. Old Burial Hill is a historic cemetery located in Huntington, New York. Part of the Old Town Green Historic District and the Old Town Hall Historic District, the cemetery has many headstones date back to the pre-Revolutionary War era. During the war, in 1782, Fort Golgotha was constructed on the cemeteries location by the British under the orders of Colonel Thompson, commander of the King’s American Dragoons. Interestingly, many of the timbers used to build the Fort were taken from a local Presbyterian church, which was later reconstructed with those same timbers after the war. Mill was added to the National Register of Historic Places. 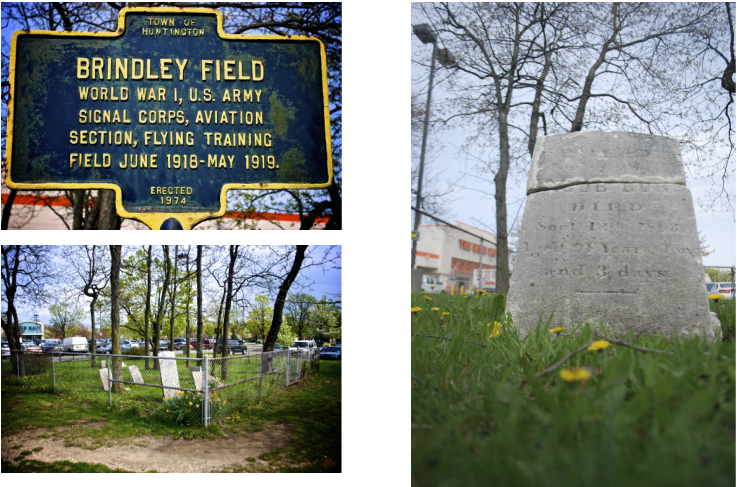 Behind the Friendly’s restaurant of Sayville lies Union Cemetery with the oldest graves dating back to the late 18th century. Purported paranormal activity includes the cemetery strange mists, apparitions, and disembodied voices. The Country House Restaurant located in Stony Brook, NY, was originally used as a home and farm by its original owner. During the 19th century. a man by the name of Thomas Haddaway, a famous English actor became the new owner of the building. It is also said that a man living nearby the Country House Restaurant during the 19th century used to hold séances in the house to speak with past spirits. 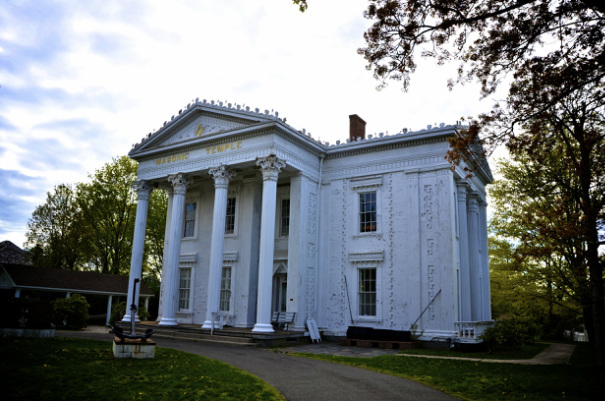 Huntington's Peace and Plenty Inn was built in 1680, and is now part of the Whitman Heritage Corridor due to it's proximity to the original home of famous American poet Walt Whitman. In the early years, the (3,500 sq. ft.) Inn was used as a local gathering area and town meeting hall. Until 1915, the building was maintained as an Inn by the Chichester family. Since then, the Inn changed hands multiple times, but always retained the original construction's beauty. Notable visitors include Walt Whitman and President Theodore Roosevelt, who would frequent for lunch in route from his home at Sagamore Hill in Oyster Bay. 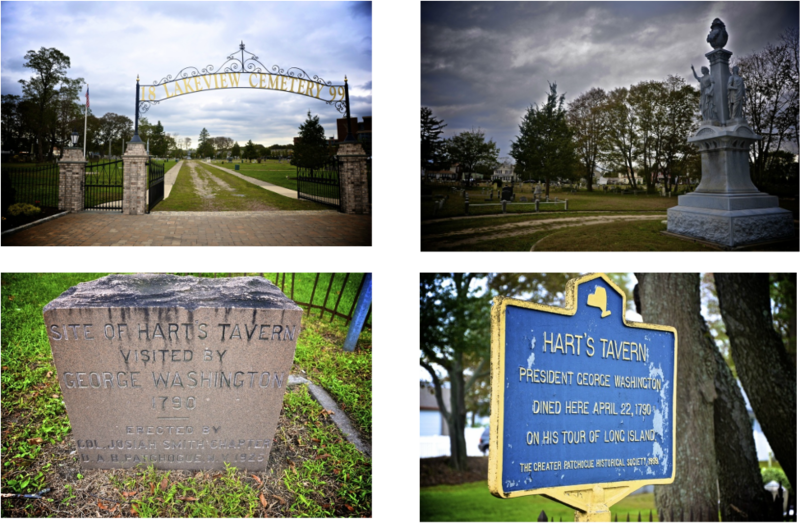 Located on the North Shore town of Smithtown, "Mary's Grave" of Head of the Harbor is loaded with history and local lore. Arguably, one of the most notable urban legends is the story of Mary’s Grave with numerous variations. One story involves a woman (named Mary) who was put on trial for being a witch, then hung to death. Another variation involves Mary’s suicide over the death of her lover who was a sailor and killed at sea. Other tales claim she murdered her abusive mother with an ax in their home, and in perhaps a more modern differentiation that tells of Mary being thrown from a moving car by her boyfriend and killed by an another oncoming car. The Maine Maid Inn was built in 1789 and later inhabited by one of the founding presidents of the Long Island Rail Road, Valentine Hicks who lived there until he died. The town Hicksville is named after Valentine. The building was then sold and transformed into an inn/restaurant, which became one of the most prominent stops on Long Island's Underground Railroad during slavery. Past guests have reported apparitions, unexplainable banging, and anonvmous voices originating from a secret staircase where slaves could hide out. The building closed its doors in 2008. Located within the Muttontown Preserve, the left over ruins of a mansion once owned by King Zog of Albania can be seen in the middle of the woods just north of Muttontown Road. King Zog fled Albania in 1939 lived in England, Egypt and France until his death in 1961. Originally, this 60-room granite mansion was built for former Wall Street investor Charles Hudson in the early 20th century. Despite what some rumors may say, King Zog never actually moved into the estate. In 1955 he sold it to Lansdell Christie. As the mansion laid unused, vandals took over the property and the Christie family had the mansion demolished in 1959. Traces of landscaping, pillars of a pair of kiosks, and the gate structure at the old entrance to the grounds, is sadly the only remains left to explore. Built in between 1914 and 1919 by Otto Kahn, Oheka Castle is part of Long Island's Gold Cost in Huntington. Oheka Castle's namesake originates as an self-invented acronym by the original owner (Otto HErman KhAn), who built the estate as a summer home for his family. Throughout it's history, Oheka Castle has been featured in many movies and television shows, one of the most famous being 1941’s Citizen Kane. The Castle currently stands as a catering hall and hotel with some of the world's wealthiest attending or hosting an event at the location. Amongst numerous claims of paranormal activity surrounding the estate, there have been claims of apparitions wandering hallways and disembodied voices. On the corner of Larkfield Rd. & Jericho Turnpike In the town of Huntington, a marker stands near a Home Depot that signifies the location of a World War 1 aviation training camp of the U.S. Army Signal Corps from June 1918 - May 1919. In its first year on August. 16, 1918, a plane crashed occurred that claimed the lives of two officers (2nd Lts. C.C. Gideon & Harold Maxon. A 19th century cemetery lies nearby in the shadows of the Home Depot. In 1789, a local Methodist preacher named John Phillips erected a house of worship called the The Comac Church while serving under the pastorate of William Phoebus where they originally performed sermons in the townspeople's homes. The building itself is the oldest Methodist Church building in New York. Years later when the towns name changed its spelling, the church became “ The Commack United Methodist Church.” Since its construction, the Comac Church has undergone many alterations. Originally built in 1845 by a merchant whaler named Benjamin Huntting. In 1907, the house was purchased by philanthropist Margaret Olivia Slocum Sage, who lived there until her death in 1918. It became a Masonic temple in 1920 and in 1945 the lower floors were acquired by the whaling museum. The upper floor is still owned by the Freemasons and the building has been opened to the public since 1945. IN In 1929, Fort Hero was built as a small Army base in Montauk south of the Montauk Lighthouse. Renamed as Camp Hero in 1942 during WWII, when the Army expanded the fort and watched German U-boats that threatened invasion of Long Island, and used it as a offshore target range. 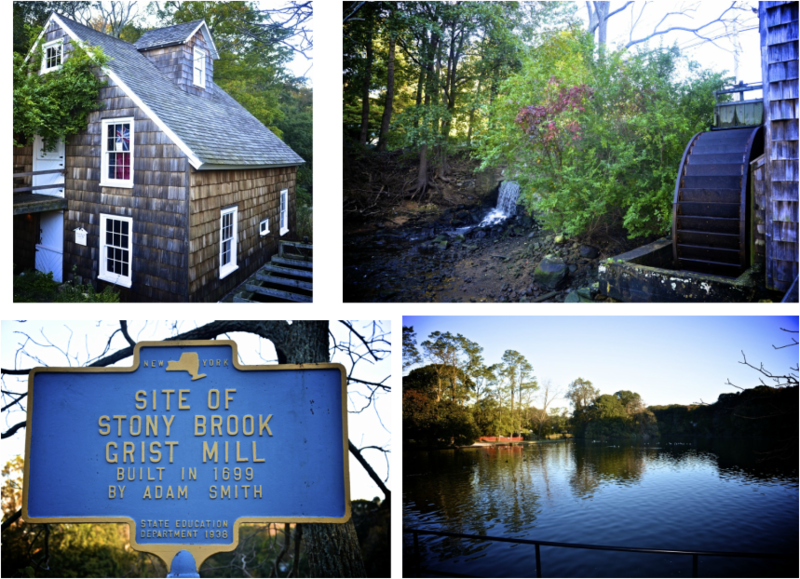 To prevent attack and invasion from Nazi spies, Camp Hero was disguised as a typical New England fishing town with bunkers built into the ground, concrete bunkers that had painted windows, and a gymnasium made to look like a church with a faux steeple. After WWII, the location was used by different military divisions for years, and then finally shut operations in 1984. 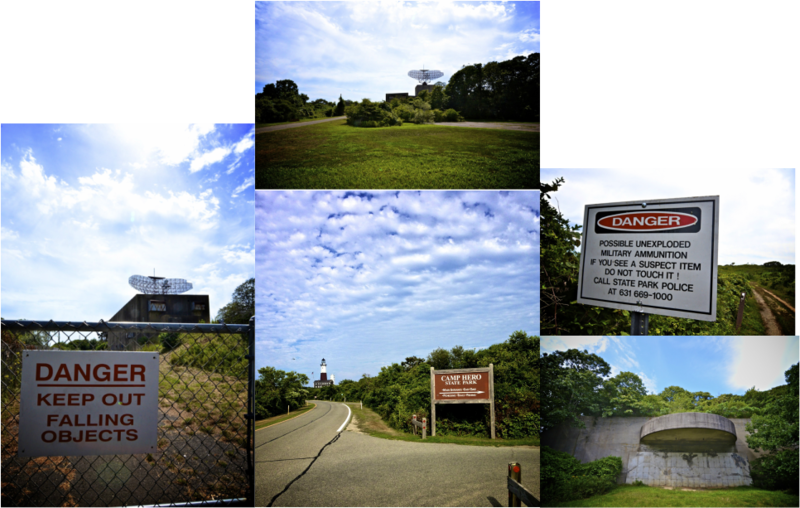 Paranormal claims include Montauk Project experiments (time travel, teleportation, parallel dimension, mind control), the "Montauk Monster," as well as, alien and UFO encounters. In 1927, Carl Fisher opened the Montauk Manor on top of Signal Hill in Montauk. The Manor was only a part of Fisher’s larger vision as one of the greatest summer resorts ever seen in the U.S. Unfortunately economic and personal troubles caused the demise of Fisher’s resort and all that remained of the original resort was the 200 room Manor, which still stands today restored to its original appearance. The Montauk Manor is built on an area of much blood shed by the Montaukett Indians who were ambushed by a New England tribe in 1663. A Native American burial ground is nearby, and It's rumored that the Manor was built on Indian graves and the land is cursed. Another rumor is that the buried bones were dug up during building of the foundation and incorporated into the building material. In the 1890's, many of Theodore Roosevelt's soldiers died from yellow fever on the Manor's grounds. Paranormal claims include a Native American apparition, anomalous sounds, and unexplainable voices. The Villa Paul Restaurant is on the site of Joseph & Phebe Brown's original log cabin, which was built in 1804. Part of this original log cabin is incorporated into the restaurant, in particular, the "Borning (Birthing) Room," which is the current Men’s and Women’s rest rooms. This area was "reserved for birth, illness and death, thereby providing both entrance and exit to this life." A large fenced in area next to the restaurant is the Old Danes Cemetery, which holds the remains of The Brown Family and Phebe Danes Brown's parents. Ownership of the property then exchanged hands multiple times from the mid 1800's until early 1900's when the property was bought by former NY Secretary of State and Judge Edward Lazansky and his wife Cora who owned it until the 1950's. After the death of Judge Lazansky, his wife Cora attempted to sell the log cabin turned mansion and decided to remove the headstones from the Old Danes Cemetery to make the property more appealing. Eventually, Paul Villa who was a successful restauranteur from Italy purchased the property and renovated the judge’s mansion into Villa Paul Restuarant. After nine years, Paul Villa sold the restaurant to his distan cousin Dominic Pensa and since 1965 has been operated by three generations of the Pensa Family for three generations since. Paranormal claims by employees and patrons include a lady specter, a man in time period clothing who walks through walls, and a ghost dog. Originally known as the Asch Building and later as the Brown Building, it's construction was completed in 1901. Most famous for the 1911 "Triangle Shirtwaist Factory Fire" tragedy that killed 146 people, which was the deadliest industrial disaster in New York City’s history until 9/11. 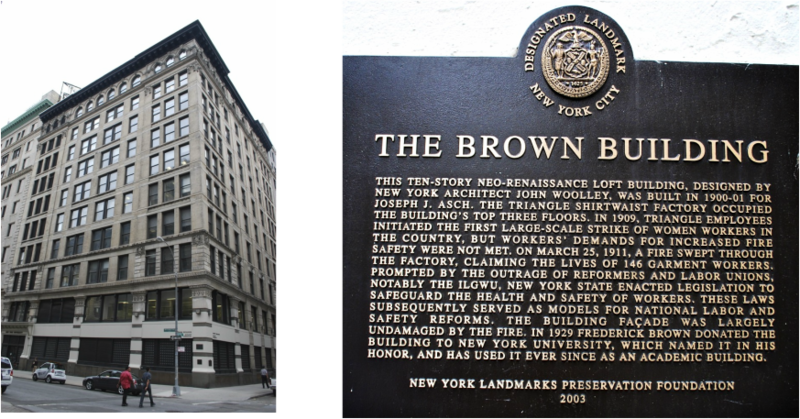 Events that led to the fire originated from a business named The Triangle Shirtwaist Factory occupied the top three floors, which regularly ignored safety guidelines. The managers of the factory welded the fire exit doors closed that prevented an exit for worked who sneaked cigarettes outside of their designated break times. One of the scrap bins on the 8th floor caught fire around 4:40pm on March 25, 1911 with flames that quickly engulfed the Greene Street stairway and prevented exit through one of the few escape routes. Two freight elevators slowly brought only few people to safety on the main floor, until workers pried the elevator doors open and jumped onto the top of the car in hopes of escape The elevator sustained too much damage from the weight of people on top, and could no longer operate and rescue people. Some jumped to their death instead of waiting to be burned alive. The building is currently being used by Cornell University. Haunted tales exist of spirits of victims from the fire who currently roam the building. Dating back to 1844, the Ye Waverly Inn & Garden lies on the corner of Waverly Place & Bank Street. A hotspot for current and past celebrities, the Ye Waverly Inn's lush history of varying incarnations include tavern, bordello, carriage house, and tea house. Haunted tales dates back decades from previous and current customers and employees that include an apparition of a man dressed in turn of the century clothing, fires starting mysteriously, the rearrangement of items and furniture, and the feelings of presences around the restaurant and in Room 16. Since being built in 1903, the New Amsterdam Theatre has been a premiere venue and stands as one of the second oldest such location. Used as a movie house after the Great Depression, then sparsely and left in shambles until the restoration of the 1990''s to reclaim its stature. American silent film star Olive Thomas supposedly haunts the theatre where she acted on stage many times. Past employees and patrons claimed to have seen her in a green beaded dress and sometimes she's spoken. Haunted History. Set within the Shawanguck Mountain's of Historic Hudson Valley's Napanoch, The Shanley Hotel was built in 1845 by Thomas Ritch with the original name of The Colonial Hotel. The original hotel burned down fifty years later and was rebuilt and reopened for business within the year. A decade later in 1906, the land and hotel was purchased from George Gosselin by James Louis Shanley who would rename it after himself. Famous frequent guests during Shanley's near 30 year ownership included Eleanor Roosevelt and Thomas Edison. The Shanley's were even invited to President Franklin D. Roosevelt’s Inaugural Ball in Washington. There are 35 rooms, a hidden basement and a former bordello in the building. The hotel was rumored as a prominent underground railroad stop, and a spot to obtain alcohol during prohibition. Many deaths supposedly have occurred at the hotel, some accidental while other with a malicious intent. Paranormal claims include apparitions, as well as, unexplainable noises (e.g. moaning) and odors. All photos are copyright Chris Vickers Photography. Illegal to copy and/or scan without photographers written permission.